My research interests are in Romanticism, especially the poetry and poetics of the period. 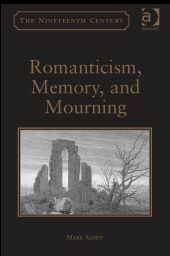 I completed a monograph on Poetics of Self and Form in Keats and Shelley (Ashgate, 2005) and a second book-length study of Romanticism, Memory, and Mourning (Ashgate, 2013). I plan to write a complementary study of Romanticism and Spectral Presences: Ghosts and Romantic Poetics. My interests in the Romantics extend to the imaginative and cultural legacies that Romanticism confers to the literary and cultural imagination of the late nineteenth century and beyond. I co-edited a critical collection of essays on Romantic Echoes in the Victorian Era (Ashgate, 2008) and edited a volume on Romantic Presences in the Twentieth Century (Ashgate, 2012). My other co-edited collections, including Venice and the Cultural Imagination (Pickering & Chatto, 2012) and The Persistence of Beauty: Victorians to the Moderns (Pickering & Chatto, 2015), explore further the complexities of Romanticism's imaginative and cultural afterlives. My most recent co-edited collection, Decadent Romanticism 1780-1914 (Ashgate, 2015), addresses more fully these concerns, touched upon elsewhere in my research, about the cultural and imaginative reactions (positive and negative) in the late nineteenth and early twentieth centuries to the Romantics. I am currently co-edting a collection on Unsettling Presences: Literary and Cultural Alternatives to Modernism (contracted with Routledge). My additional research interests in critical theory and twentieth-century British and American Literature (including Jewish American Literature of the post-war era) are brought together in discrete, but inter-related, ways in my current research project. I am presently writing a study of Transatlantic Transformations of Romanticism: Aesthetics, Subjectivity, and the Environment (under contract with Edinburgh University Press). In connection with this research, I was awarded a Visiting Scholars Fellowship (between August and September 2017) to work with the nineteenth-century rare books and special manuscripts collection at the Armstrong Browning Library, Baylor University, Texas. I am a co-director of the Department's 'Romantic Dialogues and Legacies' research group. I am an advisory board member of the inter-disciplinary Centre for Death and Life Studies based in Durham. I am part of a national network on Romanticism and Ageing, involving Keele University, and the Universities of Lincoln and Nottingham. I am also a member of the Executive Committee of the British Association of Romantic Studies (BARS) and the current editor of the Review for BARS (published twice yearly). 'Airy Children of Our Brain': Emotion, Science and the Legacy of Eighteenth-Century Philosophy in the Shelley Circle, 1812-1821. 'The Pleasure of the Senses: The Art of Sensation in Shelley's Poetics of Sensibility'. 'Romantic Dialogues: Writing the Self in De Quincey and Woolf' (Co-supervised with Patricia Waugh). I would be interested in proposals on all aspects of Romantic Literature (especially Romantic poetry; philosophy; subjectivity; grief). I would also welcome proposals for postgraduate research on any aspect of the legacies of Romantic writing, culture, and thought in British or American literature of the nineteenth and twentieth centuries. Sandy, Mark (2013). Romanticism, Memory, and Mourning. Farnham: Ashgate. Sandy, Mark. (2005). Poetics of Self and Form in Keats and Shelley: Nietzschean Subjectivity and Genre. Aldershot: Ashgate. Sandy, Mark (2019). 'Strange Truths: Romantic Reimaginings in Wilfred Owen and Siegfried Sassoon'. In Literary and Cultural Alternatives to Modernism: Unsettling Presences. Boyiopoulos, Kostas, Patterson, Anthony & Sandy,Mark New York; Oxon: Routledge. 38-51. Sandy, Mark (2018). 'Constructions et concepts du romantisme Quelques réflexions sur les perspectives anglo-saxonnes'. In Lectures critiques du romantisme au XXe siècle. Feullebois, Victoire (trans), & Diaz, José-Luis Classiques Garnier. 8: 163-97. Sandy, Mark (2017). 'American Writing'. In John Keats in Context. O'Neill, Michael. Cambridge University Press. 300-09. Sandy, Mark (2015). '"Ghostly Language": Spectral Presences and Subjectivity in Wordsworth’s Salisbury Plain Poems'. In Romanticism and Philosophy: Thinking with Literature. Laniel-Musitelli, Sophie & Constantinesco, Thomas Abingdon, Oxon: Routledge. 60-73. Sandy, Mark (2015). '"The Enigmatical Beauty of Each Beautiful Enigma": The Persistence of Beauty and Death in the Poetics of Walt Whitman and Wallace Stevens'. In The Persistence of Beauty: Victorians to the Moderns. O'Neill, Michael, Sandy, Mark & Wootton, Sarah London Brookfield, Vermont: Pickering & Chatto. 71-85. Sandy, Mark (2015). '"The Last Great Romantic": Nietzsche's Decadence Out of the Spirit of Romanticism'. In Decadent Romanticism 1780-1914. Boyiopoulos, Kostas & Sandy, Mark Ashgate. 131-144. Sandy, Mark (2013). 'Quest Poetry: Alastor and Epipsychidion'. In The Oxford Handbook of Percy Bysshe Shelley. O'Neill, Michael, & Howe, Anthony Oxford UP. 272-88. Sandy, Mark (2012). '"Fiery Particle": Keats's Romantic Presences in the Writings of F. Scott Fitzgerald'. In Romantic Presences in the Twentieth Century. Sandy, Mark Ashgate. 149-162. Sandy, Mark (2012). 'Reimagining Venice and Visions of Decay in Wordsworth, the Shelleys, and Thomas Mann'. In Venice and the Cultural Imagination: 'This Strange Dream upon the Water'. O'Neill, Michael, Sandy, Mark & Wootton, Sarah Pickering & Chatto. 27-42. Sandy, Mark (2008). '"Echoes of that Voice:" Romantic Resonances in Victorian Poetic Birdsong'. In Romantic Echoes in the Victorian Era. Radford, Andrew, & Sandy, Mark Aldershot: Ashgate. 155-173. Sandy, Mark. (2007). ''Ruinous Perfection': Reading Authors and Writing Readers in Romantic Fragments.'. In Romanticism and Form. Rawes, Alan. Basingstoke: Palgrave Macmillan. 60-77. Sandy, Mark. (2002). '"[W]hate’er these words cannot express": Transgressive Fictions in Shelley’s "Hymn to Intellectual Beauty", "To a Skylark", and "Ode to the West Wind".'. In Silence, Sublimity and Suppression in the Romantic Period. Price, Fiona. & Masson, Scott. New York: Edwin Mellen. Mellen Studies in Literature: Romantic Reassessment 157: 37-57. Boyiopoulos, Kostas, Patterson, Anthony & Sandy, Mark (2019). Literary and Cultural Alternatives to Modernism: Unsettling Presences. Studies in Twentieth-Century Literature. Routledge. Boyiopoulos, Kostas & Sandy, Mark (2015). Decadent Romanticism: 1780-1914. The Nineteenth Century Series. Ashgate. O'Neill, M, Sandy, M & Wootton, S (2015). The Persistence of Beauty: Victorians to Moderns. Pickering & Chatto. Sandy, Mark (2012). Romantic Presences in the Twentieth Century. The Nineteenth Century Series. Ashgate. O'Neill, Michael, Sandy, Mark & Wootton, Sarah (2012). Venice and the Cultural Imagination: 'This Strange Dream upon the Water'. Pickering & Chatto. Radford, A. & Sandy, Mark (2008). Romantic Echoes in the Victorian Era. The Nineteenth Century Series. Aldershot: Ashgate. O'Neill, M. & Sandy, M. (2006). Romanticism: Critical Concepts in Literary and Cultural Studies. Critical Concepts in Literary and Cultural Studies. London: Routledge. Sandy, Mark (2016). "Lines of Light": Poetic Variations in Wordsworth, Byron, and Shelley.'. Romanticism 3(22): 260-268. Sandy, Mark (2012). 'Wordsworth and the Circulation of Grief'. Essays in Criticism 62(3): 248-264. Sandy, Mark. (2011). '"Cut by Rainbow": Tales, Tellers, and Reimagining Wordsworth's Pastoral Poetics in Toni Morrison's Beloved and A Mercy'. MELUS 36(2): 35-51. Sandy, Mark (2008). '"The Colossal Fabric’s Form": Remodelling Memory, History, and Forgetting in Byron’s Poetic Recollections of Ruins'. Romanticism and Victorianism on the Net (51). Sandy, Mark & Wootton, Sarah (2008). 'Modelling the Self: Subjectivity and Identity in Romantic and Post-Romantic Thought and Culture'. Romanticism and Victorianism on the Net (51). Sandy, Mark (2008). "Webbed with Golden Lines:" Saul Bellow's Romanticism. Romanticism 14(1): 57-67. Sandy, Mark (2006). Twentieth- and Twenty-First-Century Keats Criticism. Literature Compass 3(6): 1320-1333. Sandy, Mark (2000). '"Stormy Visions:" Shelley's Re-invention of Myth, Memory and Identity in Adonais'. The Keats-Shelley Review (14): 84-94. Sandy, Mark. (1998). '"To See as a God Sees:" The Potential Ubermensch in Keats's 'Hyperion' Fragments'. Romanticism 4(2): 212-223. Sandy, Mark (2002). Percy Bysshe Shelley: A Biographical Entry.